Let’s say you’re an enthusiastic collector of Star Wars stuff – in fact, you have a passion for collecting Star Wars cereal boxes. There are a bunch of advanced search options, but we’ll come back to those later. AuctionSieve starts retrieving the items. 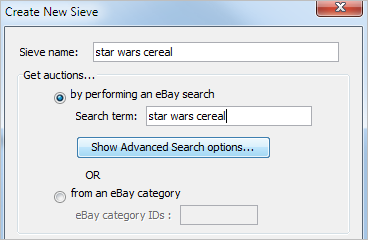 Instead of paging through 50 results at a time on eBay, AuctionSieve downloads all the results at once. If there are over a 2000 items, you may just have time to grab a coffee but in most cases it’s lightning fast. In this case, there are only 3 pages worth – about 150 items. 148 items have been retrieved. Yay, an auction for some C-3POs with no bids and only $9.99! – just what you want. You’re interested in C-3POs so let’s group those together. Highlight the text and click ‘Add to Catch Words’. Wow, there’s even a sealed box with a Buy It Now of $60.00. You click on the View link to see the item details in your browser. Wait a sec, what’s that cookie jar doing there. You’re not interested in that. You couldn’t care less about cookie jars, so let’s get rid of them. Below the results window, another table shows all the matches – there are only 2 matches for cookie. You definitely don’t want to see those. Go ahead and hit ‘Add to Trash Words’. Now you’ll never see cookie jars again. 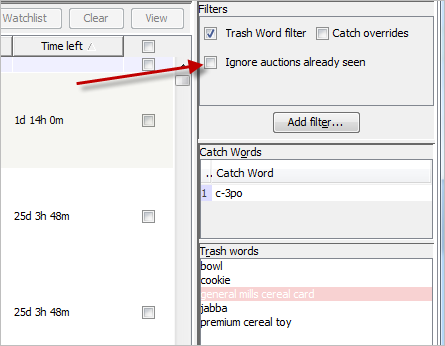 The great thing is, catch and trash words are stored by AuctionSieve. 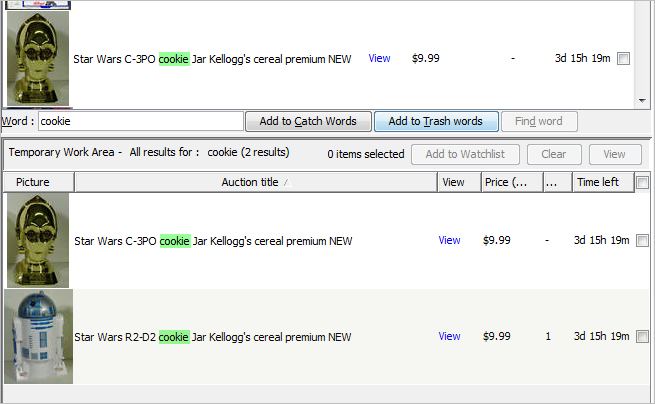 When you run the same search tomorrow, all cookie jars will be filtered out automatically! Looking through the results, you notice other junk you don’t want. You don’t want cereal bowls. You don’t want anything with Jabba the Hutt. 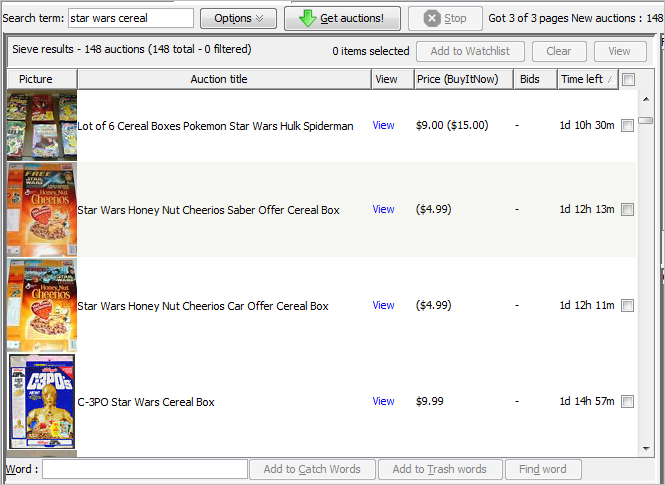 There’s an annoying seller that puts ‘PREMIUM cereal TOY’ in all their item descriptions. You highlight those words and trash them like there’s no tomorrow. 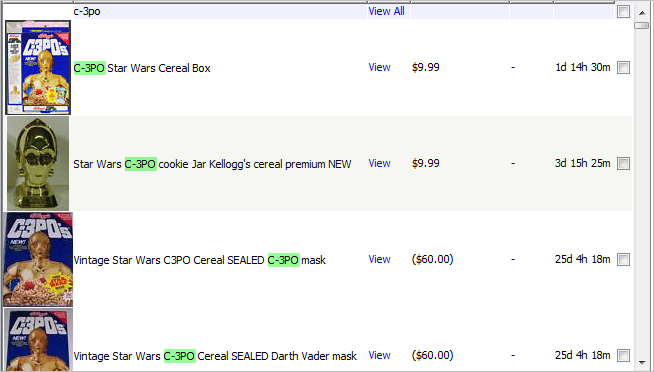 After searching through all the downloaded results, you still can’t find the Limited Edition, Gold Plated C-3PO Cereal Spoon Set… no joy. But don’t despair…you don’t have to go through those particular results next time you run AuctionSieve. Click on ‘Ignore auctions already seen’. 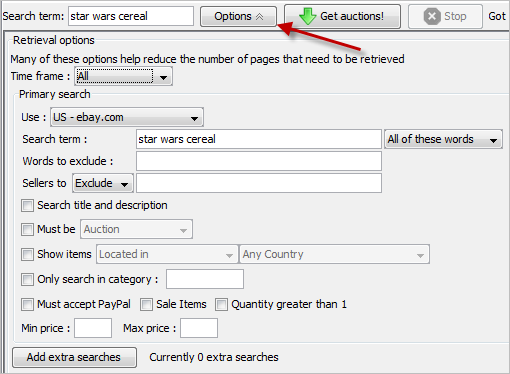 As a power user, you’ll be wanting to specify more advanced search criteria to eBay. You can explore all these by clicking the Options button. A panel drops down where you can specify things like a list of seller ids to exclude, where in the world to search, maximum prices, etc. This has merely scratched the surface of what AuctionSieve offers. Over time, I’ll be posting more screenshots and how-tos on the blog. In the meantime, explore and don’t be afraid to try out all the features. May you always be the highest bidder! Great buyer! A++!